There are several apps available produced by some of the major printer manufacturers, including HP, Epson, Canon and Brother, which will enable printing directly from your wireless device to one of their wireless printers. You can easily find these by entering “print” in the iTunes or Google Play app search. These proprietary apps are available at no cost, and there are other “universal” apps available – some free, and some for a price. There are limitations with these apps, however. For instance, while the HP ePrint for Android app does a nice job of printing documents and photos, printing an email is not an option. In any event, if you already have a wireless printer, you may want to check out these apps, since the printer-specific apps are free, and certainly worth a try – especially if you only need to print to a single printer. HP, Epson, and Lexmark also offer a series of AirPrint-ready printers, which will directly connect and print wirelessly from your iOS (iPad, iPhone, Mac) devices. If you’re in the market for a new printer anyway, you might as well take a look. 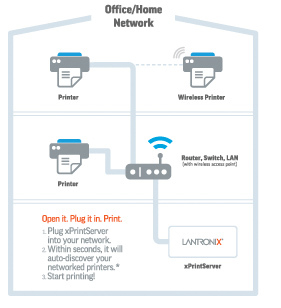 There are several apps available which will connect to your wireless network, and then print through your networked printer. Printopia, Printer Pro, and Print & Share are a few popular choices in iTunes. Be careful if you’re looking into these, as some are Mac-only apps (e.g., Printopia), which won’t work in a Windows computer environment. The downside of this scenario is that you are actually printing through a computer, which is in turn connected to your printer. So, you’ll need to have your computer online any time you want to print. While it works well, it adds a level of dependency on a computer. 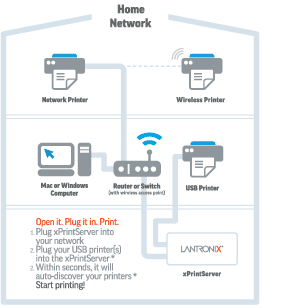 One of the coolest printing solutions I’ve seen recently is a hardware device which eliminates the need to feed your signal through another computer -- the xPrintServer by Lantronix, which I first read about on iPhoneJD, in the weekly “In the News” column. The link there takes you to a luke-warm review, found in the New York Times tech section. After trying out the xPrintServer, I’d have to say this is one very slick, well-designed device. I opened the box, didn’t bother reading any of the literature (one should only refer to instructions when/if absolutely necessary – sort of like asking for directions when traveling), plugged in the device, connected to my network via the included cable, and then printed an email from my iPad – all in around 5 minutes. It works. Some of the major benefits of the xPrintServer are computer-independence (you don’t need to have a networked computer running in order to print), platform independence (works on both iOs and Windows networks), thousands of printer choices (over 4000 printers currently supported, others available upon request), and it allows you to keep and use whatever printers you already have. Additionally, the Home version features a USB input, allowing you to connect your printer via a USB cable, meaning you can "network" your standalone printer. xPrintServer doesn’t support Android devices at this time, although Lantronix is a networking solutions company, and I’d hope/expect to see it at some point. You’re able to print wirelessly from your Mac or Windows laptop to a networked or USB printer connected to the xPrintServer by using the Apple Bonjour Printing service – again without requiring running your print job through another computer, and without the necessity of a wireless printer. The Mac OS allows you to simply add a new printer. If you have a Windows system, you can get additional info and download the Bonjour Printing here. Printing from my Windows laptop through the xPrintServer was as quick as printing directly through my network. This makes setting up portable (war room) wireless printing for a trial team simple. Since it connects via a standard network cable (included) to your network, security exists via your network. In other words, if your iPad is on the same wireless network as your printer (wired or wireless), you can print, without the need to log in to anything else. If you're not logged in to the network, you will not have access to the printer, or data sent to it. There are a couple of options available – the Network Edition, and the Home Edition, which I tested. For small and home Offices, the Home Edition should fit the bill. For larger installations with several users, the Network Edition will work. One main difference is the USB interface, currently included only in the Home Edition, although the Network Edition should include this in the future. c. Wired or wireless printers. 2) Network Edition – Designed for small to medium sized businesses. Admittedly, the xPrintServer is a bit pricier than your average app. However, you are getting a piece of hardware, which in effect, can eliminate the need for using a computer to enable printing. Rather than comparing the cost with that of an app with only part of the functionality, the fairer comparison might be the cost of a computer or a new printer. This device can easily be used at home, in the office, and easily set up in remote locations. Rather than a single specific function, the xPrintServer can be adapted to a wide variety of current and future situations. Feel free to post any questions in the Comments section below. I'm having a hard time printing out a test document from xprinterserver home edition. I can print it when it's wired but can't when it's wireless. It says that it's connected, I installed the appropriate drivers but nothing. I'm using the samsung sm-p900 tablet. Not sure, but you might try contacting the manufacturer. Also might see if any other devices will work. If not, may want to check the configuration.